Rookie Kym Lebois will remain on Carlton's list in 2019 after signing a new contract. Rookie Kym Lebois is in line to make his VFL debut on Sunday after overcoming injuries. Rookie Kym Lebois is on a mission to make a name for himself and his people. Taken with Carlton’s first selection at No.5 in the 2016 Rookie Draft, LeBois gained instant attention with an impossible goal against Melbourne at Casey Fields in February 2017. Though yet to feature in a senior match, LeBois with his renowned speed and evasiveness, and canny goal sense, is without question one to watch. 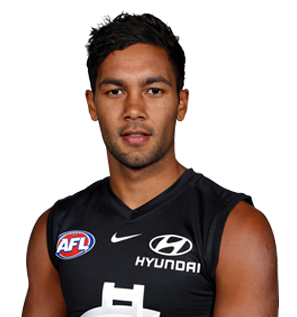 Draft history: 2017 Rookie Draft selection (Carlton) No.5.